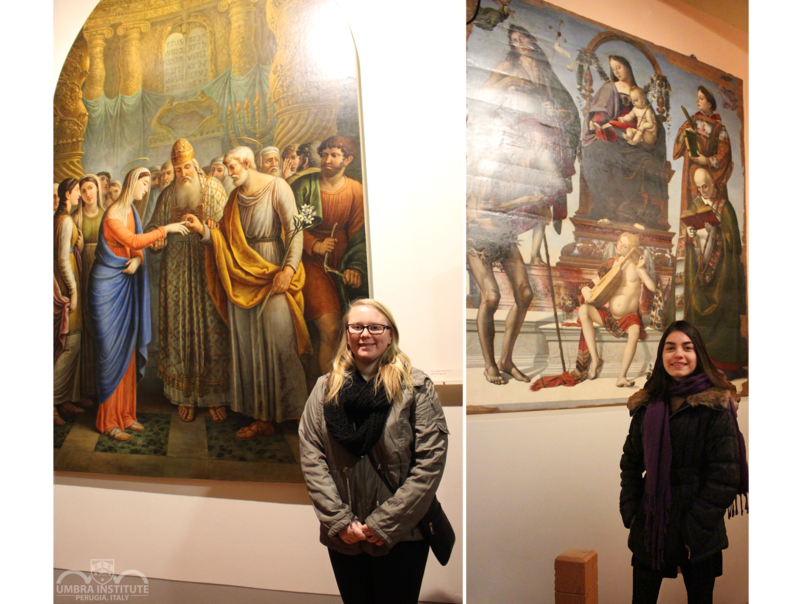 Audrey Reiley ’17 and Sarah Johnson ’17 are both LVC art & art history majors currently studying abroad at the Umbra Institute, an American study abroad program in Perugia, Italy. At home in the U.S., Reiley and Johnson are working on the Sacred: Image, Text, Ritual Exhibition, which is scheduled to open this coming fall. During an interview with Umbra staff, Reiley and Johnson were excited to share the plans for their exhibition work at LVC and were quick to discuss how it directly relates to their experiences in Perugia. The Sacred: Image, Text, Ritual Exhibition, awarded funding through an Edward H. Arnold and Jeanne Donlevy Program for Experiential Education grant, is a project designed to explore the sacred art and diversity that is representative of the traditions of Buddhism, Christianity, Hinduism, Islam, and Judaism and is directed by Dr. Matthew Sayers, LVC associate professor of religion, and Dr. Barbara McNulty, director of LVC’s Suzanne H. Arnold Art Gallery. Reiley and Johnson are contributing to the exhibition’s research and development alongside two LVC religion students, giving them all the opportunity to develop professional skills through practical interdisciplinary experience. Reiley and Johnson were selected to take part in Umbra’s CESP 352: Museum Studies: Seminar and Practicum. The course practicum provides students with direct experience in local museums, including Perugia’s Palazzo Sorbello House Museum and the Museo Capitolare di San Lorenzo. Their work with these museums enables them to become familiar with the operations and functions of museums by working alongside museum staff to create promotional material in English; archive new museum additions; develop and give guided tours; and prepare exhibitions, conferences, and other cultural events. “I don’t know how to catalogue objects yet, but that is something I really want to learn because I feel like it could be a really useful skill anywhere and could let me work in any department of any museum,” said Johnson, who also has a minor in world classics. She also shared how she believes the practicum experience will help her in her future career. The seminar sessions complement hands-on activities through the discussion of theoretical aspects of museum studies, as well as the cultural and artistic heritage of Italy, Umbria, and Perugia. Johnson also talked about how her enrollment in HSWS 380: Saints, Sinners, and Harlots is benefiting her work on the exhibition because it gives her new background and perspective regarding religious objects in Catholicism. In addition to a pair of art history courses, Reiley is taking ARFP: Fresco Painting, a course she described as a complement to her major studies. Through her fresco class, she is learning about how frescos are painted as she works alongside her classmates to create an on-site fresco at Villa Vallerosa. “We have visited sites in Perugia and Assisi to study fresco style and research different pigments,” Audrey explained. She then shared what she learned during a visit to the Basilica di San Francesco in Assisi where a large fresco can be found that is now black and white. She said that the fresco boasts the appearance of a photographic negative, due to the oxidation of the types of pigments that were used at the time of that fresco’s creation. 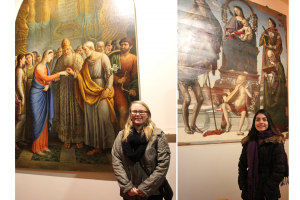 Reiley and Johnson are both committed to taking advantage of the many opportunities to study art history in Italy during the remainder of their time abroad. They have greatly enjoyed Italy’s initiative that makes all national museums free for those who visit on the first Sunday of every month, giving them the affordable opportunity to visit well known art galleries and museums across the country. Though they will miss their time overseas, they look forward to seeing the results of research and dedicated studies culminate in the Sacred: Image, Text, Ritual Exhibition coming in Fall 2017. The Umbra Institute is an American study abroad program located in the central Italian city of Perugia. Perugia is the ideal setting to study abroad in Italy, with a vast variety of fine arts, psychology, business, and liberal arts courses. It also offers a wide range of community engagement offerings, including seminars and practica, service learning, and community-based courses. For more information about the Umbra Institute, see the website above.